On Sunday morning, as part of the Tikkun Olam Breakfast at Adath Israel Synagogue, I attended a much-anticipated presentation by the President of American Jewish World Service, Ruth Messinger. I knew of Ms. Messinger’s work when she was Manhattan Borough President (1990-1998) and when she lost the mayoral race to the incumbent candidate Rudy Giuliani in 1997. The next year, she shifted professional gears and became the President and CEO of the AJWS and brought it into philantropic maturity and prominence. Now in its 25th year, AJWS funds local grass-roots development projects around the world. In 2005, the New York-based Forward named Ms. Messinger to the top of its annual “Forward 50” list of the most influential American Jews (and re-named to the 2009 list– placing four out of the last five years!). Why is a Jewish organization involved in development work amongst non-Jews? It provides a visible, positive presence for Jews in areas of the world that are not familiar with Jews (and its difficult relations with its Christian and Muslim brethren). And, unlike the disaster relief agencies, AJWS stays for the long-haul, soliciting input from the local people on their needs and wishes for a better future. They work with the local leaders, in particular the women, in choosing which projects to implement. The morning session also included presentations by Pesach Stadlin, a local boy who’s now a staffer with AJWS, and Monica Oguttu who spoke about the series of development projects she’d initiated in rural Kenya. Pesach cited statistics that 1 out of 6 people in this world go to bed hungry. Instead of the term “developing world” or “the Third World” (passé by now), he prefers the term “two-thirds of the world” because it gives a better scope of the hunger problem. Ms. Oguttu spoke about the PHD of the developing world: poverty, hunger, and disease. She was a midwife in the capital city of Nairobi when she became aware of the shortages of health care available to the rural women and she formed what became a network of 350 health professionals. Once she was apprised of the shortages of hospital beds– total strangers had to share a bed– she developed home-based care kits and bicycles. Then, she was alerted to the problem of starving patients trying to tolerate strong medicines on an empty stomach, so she identified local cereals—soya, millet, amaranth– that could be milled into a nutritious flour mixture. Most recently, she tacked the problem of adolescent girls who stayed out of school during their menstrual periods due to the lack of feminine sanitary supplies. Her female brainstorming team came up with a local product—reusable sanitary towels—that they’re now marketing for profit. Another important word about disaster relief: they do not need our surplus food, old shoes or clothes! The essential need is for money that could be used to purchase local products, which usually are available. Quoting then U.S. Secretary of State General Colin Powell who was in Sri Lanka in January of 2005: the highest point in that country was a mountain of donated blankets—for a country that does not experience cold weather at all! Well, if you’re not a subscriber (who may be getting the good-bye letter by now), you’re out of luck. 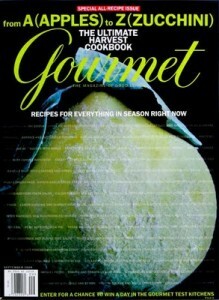 The newsstands and bookstores did not get any additional copies and they’re most likely sold out by now. You could check with your local library. Me, I’m relishing my September issue of Gourmet, which was billed as the “The Ultimate Harvest Cookbook” with recipes for everything in season from A (apples) to Z (zucchini). The other night we had a most unusual guest in our sukkah — a three-inch-long praying mantis. We didn’t know they even thrived in our eastern part of the United States. It landed on the cornucopia my husband had placed on the table and it was moving its mouth like it was praying (or most likely, chewing its prey). It was very appropriate for our Chinese sukkah, as the praying mantis is prominent in Chinese folklore and martial arts. For us, the praying mantis and the Biblical Yitzhak were among the ushpizin (guests) for the second night of Sukkot. Before the onset of Sukkot, I’d attended the Pennsylvania HIAS’s annual luncheon billed, “A Matter of Faith: Embracing Immigrants and Refugees.” HIAS was established over 126 years ago as the Hebrew Immigrant Aid Society and it has an illustrious history of assisting Jewish refugees from all over the world. In recent years, HIAS has merged with the Council Migration Services and their clients are now refugees fleeing political or religious persecution from places such as Myanmar (formerly known as Burma) and Eritrea. The panel of speakers were members of the clergy of various faiths, including the Reverend Suzan Hawkinson of the Wallingford Presbyterian Church (her sermon gave me shivers! ); Pastor David Shaheen of the Christ Lutheran Community Church (whose parents hosted Displaced Persons after WWII); Monsignor Hugh Joseph Shields, who works in the Office of the Vicar for Hispanic Catholics (he’s lived and worked for years in Latin America); Achmad Munjid, an imam of the Al Falah Indonesian Mosque (his doctoral dissertation is on key thinkers of inter-religious dialogue in Indonesia); and Rabbi David Strauss of Main Line Reform Temple. Rabbi Strauss spoke about how the mitzvah that’s repeated most often in the Torah is the one to “remember the stranger, because you were once a stranger in the Land of Egypt.” Pastor David Shaheen spoke about how “we are all pilgrims journeying to another Land and we have to learn to travel together.” The moderator, Abby Stamelman Hocky, executive director of the Interfaith Center of Greater Philadelphia, noted that Jews would soon be celebrating the holiday of Sukkot and that we can work to make a real Sukkat Shalom with our embrace of the stranger in our midst. The message of both Sukkot and Pesach is about remembering the stranger. We can do so with a shared meal, a gift of our time, or a helping hand in learning to adapt in a new culture. As a new HIAS volunteer, I’m learning about the customs of the Burmese and one nice ritual that HIAS offers is a welcome meal, prepared by other refugees– those who’d landed earlier, that is– for a family newly arrived from the airport. With my budding interest in Burmese culture, I even made a traditional Burmese dessert, htamane, which is made with glutinous rice, coconut milk, a whole cup of vegetable oil, and generous handfuls of roasted peanuts, sesame seeds, cashews and pistachios. I served it for Rosh HaShanah, but my guests did not appreciate it. I guess it was too foreign for their taste. 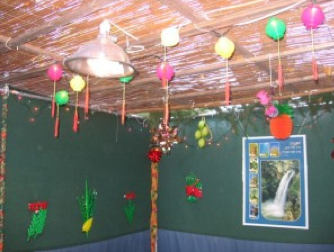 Back to Sukkot: The Chinese Harvest Moon Festival falls on the 15th of the eighth month and as it’s also on the lunar cycle, it always coincides with the Jewish holiday of Sukkot. I’d never marked the coincidence before, but this year I researched the moon cakes which are traditionally served on the Harvest Moon Festival. However, the molds used to prepare the cakes are not available to the general public, so I attempted a recipe for Buddha cookies, which Chinese bakers make from the leftover pastry dough of moon cakes. Alas, my attempt failed and the results tasted nothing like the real thing, but more like the Jewish egg kichel, which is sometimes served on Pesach/Passover (probably from the liberal egg wash I gave the morsels of dough before baking). The Cantonese-style moon cakes are shaped round or square with a sweet filling of black bean paste or lotus seed paste. Some have the addition of duck egg yolks, which when baked appear round and golden like the moon, surrounded by the rich, dark filling that can stand for the dark Outer Space. Well, I did have more success with hospitality than serving authentic holiday Asian food on Sukkot, as my guests did well enjoy the other foods that I served. And I have hopes for greater involvement in Welcoming The Stranger as I have my appointment with HIAS to discuss my shidduch (match) with a Burmese family due to arrive on the 15th. I’m looking forward to introducing them to American culture, with a Jewish twist.